Ulf Plessentin: Nov. 8, 2016, 4:56 p.m. Which research areas are covered by the ten Käte Hamburger Centres in Germany? Which valuable effects do these institutions have on the research structure of Germany's universities? How do their work influence international research and the faculty culture? 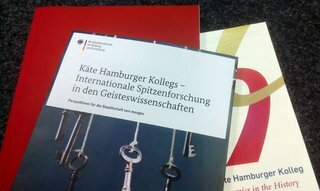 These an more questions are answered by the newly published broschure "Käte Hamburger Kollegs - Internationale Spitzenforschung in den Geisteswissenschaften. Perspektiven für die Gesellschaft von morgen" [German version only], by the Federal Ministry of Education and Research (BMBF).